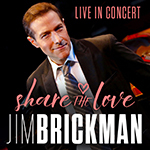 Brickman’s distinctive piano style has made him a driving force behind modern American music with his popular songs like “Valentine,” “Love of My Life,” “Angel Eyes” and “If You Believe.” All throughout 2017, the ever-popular pianist will fill theatres with laughter, love and inspiration. Jim Brickman’s LIVE concerts have become an annual tradition. He lives and breathes the music he creates and is thrilled to introduce fans to his most recent songs and perform them live in concert halls across the world. Jim Brickman’s music reminds us that faith, love and togetherness are what we value most throughout the year. Join Jim Brickman this year and celebrate the hope, fait and peace that are truly at the heart of a Jim Brickman concert experience. Jim Brickman has transformed the genre of solo piano music with his original pop-style instrumentals and star-studded vocal collaborations. Brickman’s extraordinary keyboard skills have earned him 21 Number One albums and 32 Top 20 Radios Singles in the industry bible, “Billboard” magazine. He’s garnered two Grammy nominations, gospel music’s Dove Award, two SESAC Songwriter of the Year Awards, and the Canadian Country Music Award. He also has a music scholarship named for him by his alma mater, the prestigious Cleveland Institute of Music. Born and raised in Shaker Heights, Ohio, Brickman began his music training at the age of five. But young James wouldn’t conform to the rudimentary regulations of piano lessons. “He didn’t have the knack for it,” his first teacher would say. That didn’t discourage the tenacious pianist from creating his own unique brand of musical storytelling. An innovative force in the music industry was born.